This 3 piece quilt set is better in person. The design and quality is the best. I recommend this product. Easily update your master bedroom suite with this elegant traditional 3-piece quilt set. Available in a variety of colors, this set features a traditional embroidered medallion pattern, adding a sophisticated touch to any bed. Use alone or create a layered look. Either way you'll love this lightweight soft quilt set. I agree with reviews that material is stiff. I don't mind though. Like how it covers CalKing bed. I was not happy with the quality of material on this set. I bought two sets for a guest room twin XL beds. The fit is fine, but after three washings, the quilts still are stiff and wrinkled looking. I love the quilt and shams. The pattern is lovely. My only "complaint" at present is that it is "stiff" but I am sure will soften after many washes. 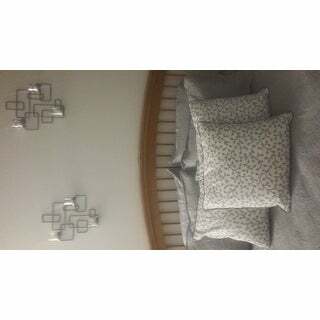 Pretty soft gray quilt set. The color and look of this set is accurate and very attractive. It is, however, quite stiff. We kept it because it is the perfect gray color to coordinate in the room we were working on. It may soften up with use. This is a very nice quilt set. The pattern is slightly old fashioned, but in a good way. It's light enough for summer and is made well. This is the 2nd one I've purchased and I would recommend. I bought 2 quilts sets as gifts. They were so pleased and they did wash up well. One was for my grandson and the other for my step son. They even posted these items on Facebook. Thats how excited they were. I liked the grey color the best. This quilt felt just a little heavy but not so much that it impeded with rest by causing too much heat. Good quality product that has been washed a number of times without pilling or visible wear & tear. i would describe the gray as being a light smoke color. Nice quality product the color was great in my bedroom! This quilt is beautiful! However...it is very stiff and the wrinkles invade anywhere it folds or bends. I tried washing it at least 5 times with no change in the stiffness at all. I gave up...it sits ina closet, used on the bed for 2 weeks max! I love it. It's so soft and comfortable. It is true to color and actually looks better in person. I paired mines up with some toss pillows I picked up. Beautiful quilt. I didn't give it 5 stars because the quality wasn't as good as I would expect. Overall its a nice quilt and that's it. This fit my needs. Shipping was great! Looks very pretty, just like a vintage quilt. Durable and washable. I have washed mine many times. Holds up beautifully. Great choice with kids as well. "The dimensions for a king/CA king are cut off, can someone clarify the width and length?" The Cal King/King Quilt: 98 inches wide x 108 inches long. "I noticed the King/Cal King size in Black is out of stock. Do you have maybe an estimate of when it might come available again?" I show it in stock. "I don't see the off-white for a queen as a selection in the drop down box. Is it currently out of stock?" Yes, it is currently out of stock; unfortunately, we do not have an estimated restock date set. "Is this really reversible as it says? If so, what are the color combinations?" I bought the gold color, which is beautiful. It is the same color on both sides. Print is on both sides as well. "Durability - has anyone washed this a few times &/or have pets that sleep on the bed? How did it do? Are there problems with pilling, fading, or loose stitching? Color - has anyone received a chocolate brown one? Hard to tell by the photo if this is more of a mid-range "Cadbury" milk-chocolate or a deep "Hershey's wrapper" brown. How would you describe the 'chocolate brown' color once it's been washed? (color saturation varies from one type of screen to another, so saying "it looks like the photo" is super unhelpful) Thanks!" This is a dark chocolate brown color. It is machine washable. This will not fade or shrink. Needed a new quilt. Exactly what I am looking for.